There’s more to New Marketing than the traditional bottom line. When I speak and lead workshops, I use terms like “New Marketing” and “Humanistic Marketing” to differentiate what is truly alive online from what is all too often useless noise. In my view, the “Alive Web” is empowered by the people power. I experience this humanity as the heart of social media. This is clearly different than content where the focus is how to make more money. This difference is important to and underscores the dimensions of what I do that are most important to me. And, from a marketing perspective, this is a meaningful dynamic that leads to authentic engagement, meaningful value exchange and real relationships. And, I think it’s also worth noting that all that noise and manipulative selling is what gives the ideas of marketing and engagement a bad name. In this post, I want to focus on the “what’s most important to me” part; but, I’m not doing that just for me. 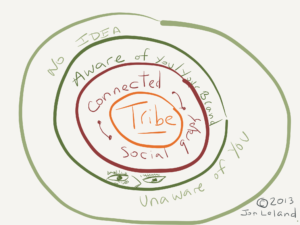 If you are in my Tribe (and I’ll get to that), it is very likely to be what’s most important to you too. And, that is actually my point. 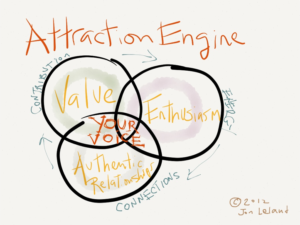 As my hand-drawn “Attraction Engine” iPad sketch shown to the right indicates, I’m a believer in the power of enthusiasm, authenticity, and leading with value. Those are the ingredients that lead to the kinds of meaningful connections that are beyond the more traditional marketing creative’s superficial positioning and messaging. I realized in conversation with a dear friend today that I need to reach out specifically to you all, My Tribe, more often. I need to do this in order to expand my work in the direction that I want it to evolve. The truth is that despite my own enthusiasm and the real value that I know I provide, like the rest of humanity, I can personally fall off the social media marketing communications track. I get derailed by my own resistance. We all know this truth: Resistance happens. And it’s important for me to name it by telling the truth about it when it happens. My blog doesn’t lie. This is my first post since late January. Yikes! Thus, this new blog post (and the new content which will follow) represent the beginning of another reinvention or refocusing of my work and offerings. Yes, I will continue to share about innovative social media and video marketing strategies, tips and insights; but the real fuel for what I consider to be meaningful success is my authentic connections with other like-minded people. I find those to be more important and valuable than I can express. So, while I’ve always been about better communications rather than just being about the exciting new technologies (as much as I love them too), I’m refocusing on the real bottom line. The real bottom line for me is making the world a better place. I’m clear that that doesn’t come from more “noise,” nor fresh eye-candy, no matter how well crafted, no matter how efficiently delivered with the latest technological innovative automations, etc. Successful communications (at least by my definition) connect people in meaningful ways and thus lead to collaborations and/or authentic relationships where real value is exchanged. Ease and grace ARE present as animating forces when you allow them to be, but the necessary resting in and allowing of the “Sounds of Silence”—the slowing down and deep listening, the actual prayers for guidance—can be uncomfortable and require the development of a new skill. I’m working on that. Are you? If so, how can I support you? I’d love to hear from you about this. Thus, what I am putting more front and center in the services that I am offering—albeit through my online marketing communications support—is fundamentally NOT about the “stuff,” i.e. the technology, nor the material success. It’s about the connections, the communities and the relationships. Truthfully, that’s the kind of abundance that I care about and value most. This expression, “Play with My Tribe to Strive” jumped out in another conversation recently, and it kind of summarizes what I’m talking about here. Secondly, I know that what I’m doing and where I’m coming from won’t appeal to everyone. That’s GREAT! I’m interested in nurturing my relationships with authentic members of my “Tribe.” What I mean by that is an informal extended network of people who are also aligned with these same values (see above), who want to play together, i.e. collaborate joyously and communicate for mutual benefit and the highest good of all. The thriving part then emerges through the soul-nurturing flow of acting in alignment with Spirit/Higher Power/Love/God (or whatever you want to call Her/Him/That). I sincerely look forward to hearing from you with your thoughts, encouragements and/or suggestions. Thanks! Rebecca, a survivor of Family Court abuse and corruption. ComBridges’ recent last minute video shoot, quick turn around video edit, and posting to YouTube project, reflected in the three video clips embedded below, (for Kathleen Russell Consulting, KRC, a social advocate and political PR firm and her non-profit Center for Judicial Excellence, CJE) was just that kind of project. KRC’s tag line is “Telling Stories, Moving Mountains.” In this case, the story is the shocking corruption and dysfunctionality in the US Family Courts, an almost entirely “untold story” that really NEEDS to be told. The tragic fact is that the lives of children and their families are being absolutely ruined by a Family Court system that (sad but true) has absolutely no independent oversight. I find this to be shocking and hard to believe, but it is clearly true. I won’t try to tell that whole story here. 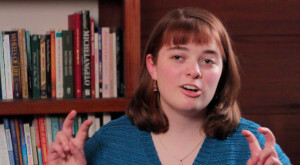 Hopefully, the three video clips below will inspire you to want to learn and do more. And there’s more information here on the CJE website. However, I must say as a video professional, this is the kind of project that I LOVE. Video is not just a technology. It’s a communication platform. 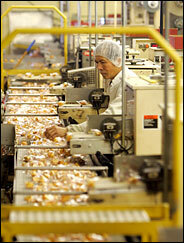 “Eye candy” is like sugar. No nutritional value. But when we use online video to tell important stories that really do need to be told, then we get an opportunity to make a real difference. I am very grateful for that. For me at least, this kind of work is what having my own business is all about. Many thanks to Kathleen Russell and the Center for Judicial Excellence for the opportunity to be of service! And BRAVO to the three courageous people shown below. I know that it takes remarkable courage and commitment to speak up and speak out. Please share and spread the word if you are so moved. Thanks. This Tuesday’s edition of TheTVNews.tv which is shown immediately below, features the links, tools and resources that can be found below the video. Enjoy! Report on research that specifically noted significantly increased video viewing times when visitors came from a more personal Twitter user’s recommendation vs from a search engine via SEO. Engagement rules! Maybe following the advice, or at least the numbers, in fortune cookies isn’t such a bad idea after all. The New York Times reveals all. If you want to learn to play better poker, I’ve got a tip or two for that too. Click here. 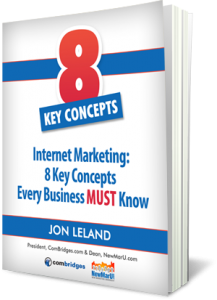 http://www.combridges.com/wp-content/uploads/2017/06/ComBridges-Logo-300x60-300x60.jpg 0 0 JonLeland http://www.combridges.com/wp-content/uploads/2017/06/ComBridges-Logo-300x60-300x60.jpg JonLeland2005-05-12 09:45:002005-05-12 09:45:00The Fortune Cookies Were Right! I don’t write much about games, but it looks like the soon to be released Sony Playstation Portable is worth noticing beyond it’s gaming capabilities. Among other things, it looks to be a pretty awesome video player too. This is, in part, enabled by a new storage medium called UMD or Universal Media Discs. These baby’s hold 1.8 gigabytes! And, it won’t be long before we’ll have portable devices holding much more. For example, IBM’s got a postage stamp-sized hard drive due out within two years that is said to hold about 500 times that much. Soon, your cell phone will have way more memory than any of today’s iPods. Here’s WebProNews.com’s “Sony Gearing Up for PSP Launch” which includes links to other relevant reviews & PSP news.